Last night I watched episode 4 of Breaking Amish. I should just stop writing now. At first it was exciting to point out the lies and fakery spewing forth from TLC’s latest farce but as the onslaught continues, writing about it just starts getting depressing. Some people find it hard to understand why I want to defend the Amish against exploitative shows like Breaking Amish. Am I not an atheist after all? Do I not hate the Amish? Well yes I am an atheist but no I do not hate the Amish. The first eighteen years of my life were spent (sometimes, depending on my mood, I might say “wasted”) as an Amish kid. However, my entire family and almost all of my friends are Amish, and I love them. The Amish culture was a large part of my life and while I do not want that life for myself any longer, I will defend it with all the power of my pen from people wishing to make money by lying or otherwise exploiting them. The Amish, in my opinion, are philosophically misguided (as any religious group is) but as a group, they are the nicest people you will likely encounter. “We just had our first date last night,” Rebecca proudly tells us after a night out with Abe. Apparently when they started hanging out years ago and conceived a child, they called it something other than “dates”. A lot of people probably have questions about Rebecca’s teeth, or lack thereof. I don’t know why she had all her teeth pulled, so don’t ask me. I can tell you that the barbaric dentistry that she spoke of could be true. I know that in some of the very conservative Amish communities they really have Amish dentists armed with nothing more than a pair of pliers. Many of the Amish are not too great when it comes to their teeth. I for one, never went to the dentist in all the 18 years that I was Amish. My baby teeth either fell out on their own or I wiggled them out with my fingers (and who says Amish boys don’t cry). We brushed our teeth regularly and that was pretty much it. There were exceptions when things got really bad. I remember my sister going to a dentist for a root canal several times but other than that, I don’t remember any of my family ever visiting a dentist. My biggest beef with the latest episode is the lack of the promised and long-awaited explanations from TLC. When are they going to explain to us why they claimed that the cast members are leaving the Amish for the first time when in reality they haven’t been Amish for up to fourteen years? When will they explain to us that these kids have encountered plenty of showers, and microwaves before? When will they tell us how photos of Kate appeared on a modelling website years ago? When will they tell us about Abe and Rebecca’s baby? When will they tell us about Sabrina’s non-Mennonite wedding that happened years ago? When will they tell us about Jeremiah’s ex-wife and three kids from years ago? Do they think we’ve forgotten? Why do they keep insulting their viewers’ intelligence? TLC’s Breaking Amish: Is Kate Fake too? On Breaking Amish, Kate is portrayed as the bishop’s daughter. Supposedly she has been an Amish girl all her life (except for a brief stint in Florida where she got a DUI) and is just now truly leaving the Amish. In reality, sources tell me that Kate hasn’t been Amish for years. She has been driving a car, dressing non-Amish, and working in a Ruby Tuesdays in Lebanon, Pennsylvania. In the mugshot from Kate’s arrest in Florida for DUI, she has her hair down and looks decidedly non-Amish. Luckily for TLC, they came clean about this. 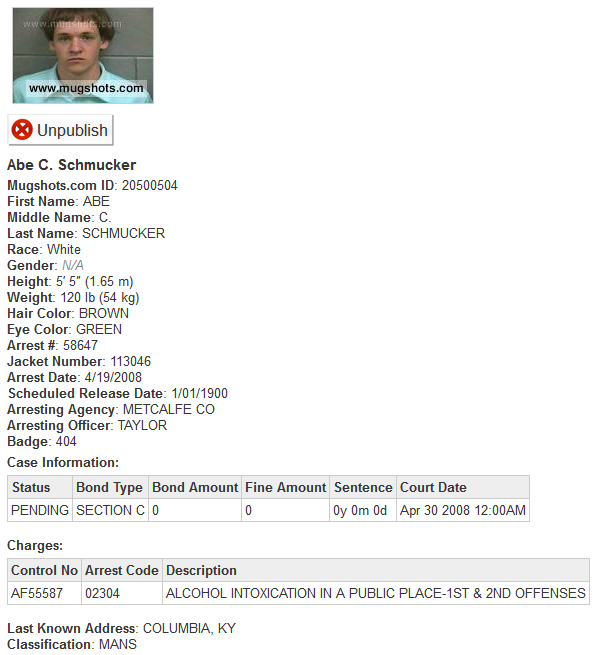 You can see the arrest record and mugshot here. 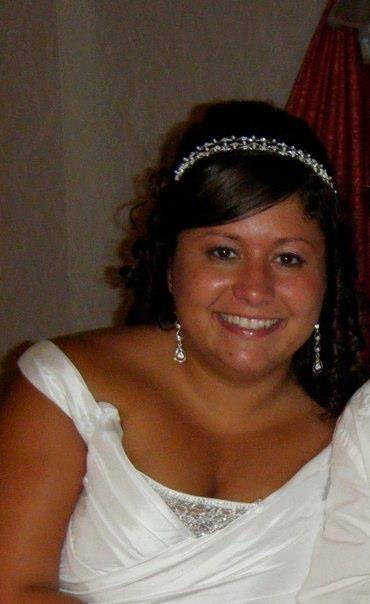 This page also shows her full name (Katie Ann Stoltzfus) and her date of birth. I love Florida’s public records policy. 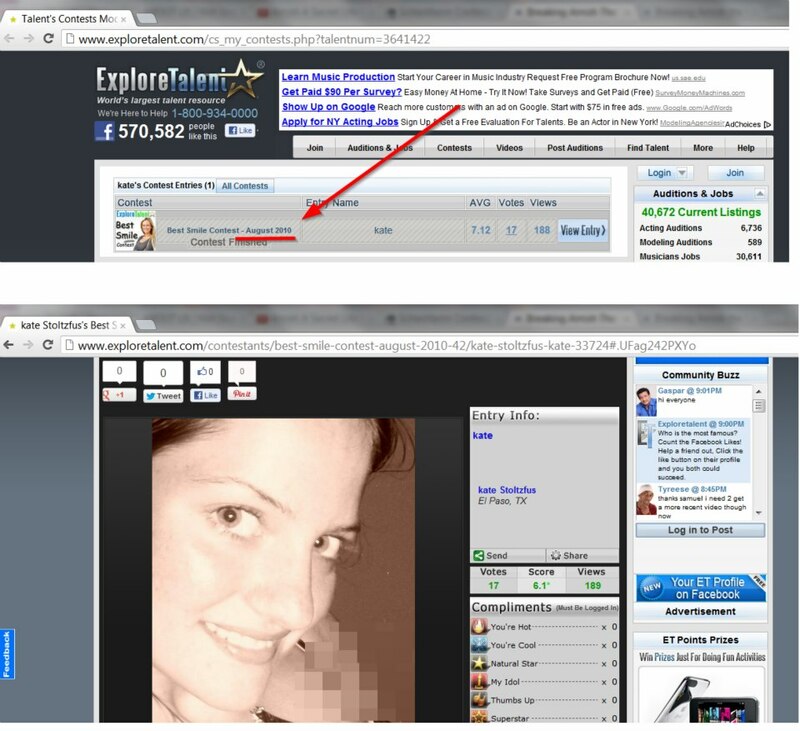 The real shocker came with the discovery (discovered about 24 hours ago) of a modeling photo posted on exploretalent.com in which Kate apparently entered a Best Smile contest. The contest was in August 2010. I guess her aspirations of being a model are real. 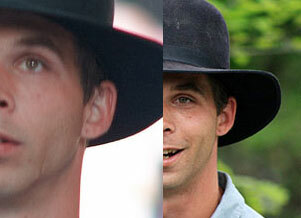 It might be the only real thing about Breaking Amish. The photo is from https://www.facebook.com/BreakingAmishTheTruth and the original tip was from Colleen Smiley. Taking a picture like this, much less posting it to a modelling site would be forbidden by the Amish. We can conclude that she did not just recently leave the Amish. Interestingly, within hours of this evidence being posted on the Facebook Truth page, the profile and everything was removed from the modelling site. Lucky for you, you can still see the original page in Google’s cache. Dear lying spammers. You can give up, now. Your comments will not be approved. Other comments will be approved after I’ve determined that they’re legit. Someone from PostWorks NY, a production company that worked on Breaking Amish, keeps spamming this blog using multiple names and email addresses in an attempt to have his or her comments posted. I sent their company an email asking them politely to stop whichever employee is making these attacks. I haven’t heard back yet. Somebody using a proxy server to hide behind is also spamming this blog using multiple names and email addresses. It seems I’ve stirred up a nest of angry hornets. Last night I watched episode 2 of TLC’s Breaking Amish. I didn’t like it anymore than the first one. The first lie occurs just seconds into the show as the following words display on the screen; “They’ll leave their community for the first time”. It has already been firmly established that that is just not true. Why does TLC keep lying to us? Do they think we’re just going to take it? One of the biggest differences between this episode and the first one, is the soundtrack. You might not even notice it unless you consciously think about it while watching, but there’s a big difference between the two episodes. During the first episode, the cast members were leaving the sinister (that’s what they’d have you think) Amish, and the soundtrack was laden with ominous music as fast-moving clouds raced across the screen. In contrast, the second episode has an upbeat and exciting soundtrack, completing the illusion that these kids have grasped onto an exciting and life-changing opportunity. Something else that I noticed was the cast’s language. I’ve heard many people (that aren’t all that familiar with the Amish) claim that the excessive use of the words “like” and “freaking” and the one occurrence of “skank” are proof that these kids haven’t been Amish for a long time. That’s not necessarily true. Many Amish kids pick up these terms during their occasional interactions with “English” kids and it spreads throughout Amish youth culture. It is nothing new to hear real Amish kids use words like that. There is, however, another aspect of their language use that indicates that Pennsylvania Dutch hasn’t been their primary spoken language for quite some time–and that is fluency. These cast members speak English fluently and comfortably, and that’s just not something that a fresh-off-the-farm Amish kid is able to do. One exception to this is when the Amish parents encourage English language use at home. It’s not common but it does happen. When the cast first reaches New York, I get the feeling that they’re acting a little too much like fish out of the water. They react more strongly to these “new” sights and experiences than the typical emotionally-reserved Amish person does. Perhaps it is because they are overcompensating for having to act like they just left the Amish. There’s a recent interview on Time.com in which an ex-Old Order Mennonite man, Tim Sauder, explains the true reactions of Amish and Old Order Mennonite upon visiting the Big Apple for the first time. Read that interview here. In this episode, Abe and Rebecca begin to like each other. Or do they? In real life they’ve been a non-Amish couple for years and even have a kid. Rebecca says she’s never lived with electricity. You mean, not even after leaving the Amish years ago? Abe claims to have never experienced a shower and doesn’t know for sure what a microwave is. You mean to say he’s so stupid that after leaving the Amish years ago, he still hasn’t encountered a microwave? Rebecca is used to an outhouse for a bathroom, and is supposedly just off the farm. She sure doesn’t have any trouble figuring out how to get a cot into their room. She claims to have never slept in the same bed with anyone else and yet evidence suggests that she gave birth to Abe’s child. Kate carries a pink, striped, Victoria’s Secret bag that is probably not allowed by the Amish. Sabrina claims Mennonites aren’t allowed to stay in hotels because they have bars. I know several Beachy Mennonite (very conservative) and they have no problem with hotels. Sabrina also wears a lot of makeup. How is that not vain? One of the cast claims that Amish guys don’t shop. Jeremiah, in a blatant show of sexism, wonders which of the girls is going to cook the food for them. I know plenty of Amish men who cook and go grocery shopping. Jeremiah implies that he’s never driven a vehicle before. So in all the years he hasn’t been Amish, he’s never driven? I know from personal experience with Jeremiah that he has driven plenty. Last but not least, the cast was incredibly mean to each other. Abe and Jeremiah insult each other behind each others backs. Rebecca is a complete bi***, and then the other girls steal her teeth. Real Amish wouldn’t fight like this, especially when put in a new environment such as New York City. Rather than fighting, they would band together and form a clique to protect each other even if they’re from different communities. One young lady on Facebook had this to say; “Those amish are mean and bullies. I thougt the amish were all about kindness and helping each other, boy I was wrong…” No! No! No! The Amish are not like this. It only happens when a few bad apples do it for the money. This show is spinning off misconceptions about the Amish left and right and that’s why I will continue spending hours and hours of my time, proving that Breaking Amish is fake.